I received an email from Chef Jeff today. He is looking for feedback on his new e-cookbook called “DinneRevolution” before he rolls it out. The cookbook sells for $27.00, so this is a good deal. The recipes are family friendly, healthy, less than 10 ingredients, and takes 30 minutes or less to prepare / cook. Chef Jeff was nice enough to provide me with a copy of his new e-cookbook, which I dearly love. I know you will love it as much as I do. 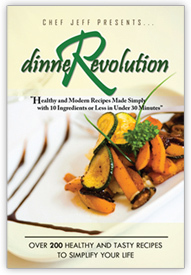 Click here to receive your free copy, http://www.dinnerevolution.com/free-offer. Hi Christine, Thank you for informing us. I just got a free copy from Chef Jeff. What a nice treat! Thanks, Christine! I've never gotten an e-book before. Thanks for sharing, Christine! Oh, that is nice of him to let you look at it and then offer it to your readers. Did you try any recipes from it yet? How do you use an ebook cookbook in the kitchen? Thanks for spreading the word about this book! No, I have not tried any of his recipes yet, but I plan on cooking several of his recipes. He has some great recipes. You can bring your laptop in the kitchen, or hand write the recipe, or you can print. Hope that answer your question. Very cool, thanks for sharing this with us! How fabulous, Christine! Off to check it out! Thank you for sharing with everyone! I'll head over to visit you.